ORLANDO – American Trucking Associations recognized the winners of several of the industry’s top honors as part of the association’s Leadership and Awards Luncheon at its annual Management Conference & Exhibition. ATA National Truck Driver of the Year Gary Plant, a professional driver with Walmart Transportation in Loveland, Colorado. Plant has more than 41 years of professional driving and has accumulated 4.4 million accident-free miles. 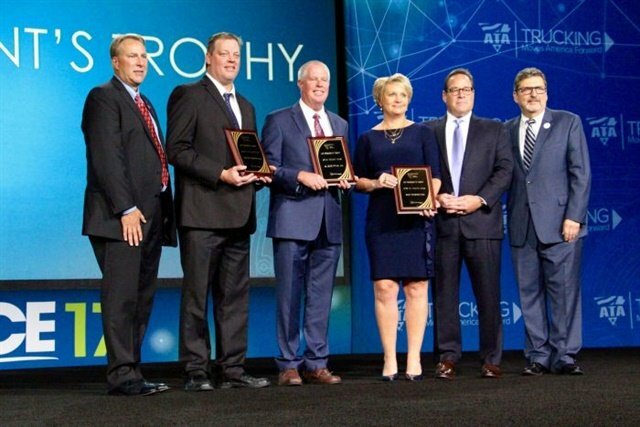 The ATA also honored three fleets with the ATA President’s Award. The award goes to fleets who demonstrate innovative approaches to safety and go above and beyond to keep the highways safe. Fortune Transportation is a for-hire, general commodities truckload fleet in Windom, Minnesota, for fleets under 25 million miles. A. Duie Pyle, West Chester, Pennsylvania, for fleets between 25 million and 100 million miles. Ruan Transportation headquartered in Des Moines, Iowa, for fleets with more than 100 million miles. ATA will be announcing the winners of National Safety Director of the Year and National Safety Professional Award of Excellence at the Safety, Security & Human Resources National Conference & Exhibition, Nov. 14-16 in Nashville, Tenn. In addition, ATA announced the winners of its first annual 5K Fun Run/Walk, sponsored by Velociti and Rolling Strong. In the men’s category, the winners were: Eric Parker, Mirza Kazarcin and Kevin Forbes. Women’s category winners were: Anna Spear, Yulia Lama and Rachel Cooper. The top finishing America’s Road Team Captain was Dion Saiz, FedEx Freight.